is a question that frequently comes up during our electrical safety training classes. 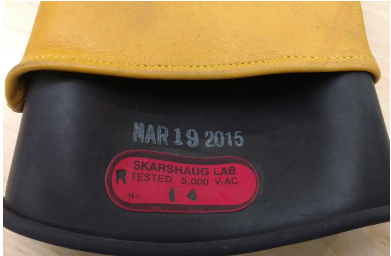 Misinterpreting the rules requiring dielectric testing of electrical insulating gloves and the corresponding expiration dates can be easy to do. Using article130.7(C)(7) of the 2018 edition of NFPA 70E as a reference, we hope to add some clarity to this commonly misunderstood safety requirement. Voltage rated rubber insulating gloves that have been previously issued, can be used safely for 6 months after the test date at which time the gloves will need to be sent back to an approved lab for dielectric testing. Even if the gloves were not issued into service they still expire after 6 months and cannot be used until they have been tested. The glove in this picture passed testing on March 19, 2015. Let’s say that the glove was issued into service on April 19, 2015. We suggest that safety professionals provide 2 pairs of rubber insulating gloves to each qualified person. One pair is sent to a lab for testing 3 weeks or so prior to the expiration date of the set currently in use. (Check turn around times with your testing vendor and adjust the schedule accordingly). Before the set currently in use expires, issue the recently tested gloves and repeat the cycle. The 6-month rule does not apply to new gloves. New gloves, that have not been issued can sit on the shelf for 12 months before they are required to be retested. However once issued, the 6-month rule applies. Remember a pair of gloves can only be “new” once. You receive new gloves with a test date of January 1. The gloves are issued to a qualified worker on February 1. The gloves will expire and require testing on August 1. If the gloves are not issued, they will expire on December 31 and will require testing. Gloves must be must also be visually inspected and air tested for any possible defects such as cuts, holes, tears, embedded objects before each day’s use and whenever there is a reason to believe they may have been damaged. Best practice is to inspect PPE and air test the gloves before each use. Gloves used without leather protectors must be removed from service and dielectrically tested before they can be used again. Gloves are available in sizes from 7 to 12, including half sizes. To determine glove size, measure the circumference of the hand around the palm. Gloves that are too big reduce dexterity and workers will find them difficult to work in. One size does not fit all. Gloves must be worn if employees are working inside the restricted approach distance to exposed energized conductors or circuit parts. The restricted approach distance to 480-volts is one foot.